28 The Miracle on Techwood Drive sent shockwaves through campus as Georgia Tech defeated ninth-ranked Florida State on a blocked field goal return. Seminoles kicker Robert Aguayo, who previously had never missed a field goal attempt in the fourth quarter, lined up for the potential 56-yard game winner but Yellow Jackets lineman Patrick Gamble blocked the attempt. Lance Austin scooped up the football, ran 78 yards for the touchdown and the rest is history. With the Georgia Tech upset, Florida State lost an ACC game for the first time since its loss to NC State on Oct. 6, 2012. The conference win streak lasted 28 games. 7 Temple has become of the biggest surprises this college football season and for the first time program history, the Owls have a 7-0 undefeated record. Seven wins is already more wins than the Owls have had in each of their three previous seasons. The biggest test on the rest of its schedule lies with the matchup against No. 9 Notre Dame in Week 9. If the Owls can pull off the upset, it would be the first home win as a ranked team sicne 1941 and first time defeating ranked teams in consecutive seasons. 58 Miami suffered the worst loss in program history behind a dominating performance by Clemson. The previous largest margin of defeat by the Hurricanes happened in 1944 with a 56-point loss to Texas A&M. Clemson averaged 6.4 yards per play, rushed for 416 yards and compiled 33 first downs. Meanwhile Miami had only six first downs, committed three turnovers and had more penalty yards than rushing yards. 100 Mount Union won its 100th consecutive regular season game with the 69-0 win over Wilmington on Saturday. But it isn't the first time the Purple Raiders have accomplished this impressive feat. Mount Union previously won 110 straight games which lasted from 1994 to 2005. In fact, the last time the program has lost during the regular season was when its previous streak ended with that 2005 loss. 108 Memphis and Tulsa battled it out in an offensive shootout Thursday night as the two teams combined for 108 points, the most total points scored in FBS this season. The Tigers were led by Heisman dark horse candidate Paxton Lynch, who threw for 447 yards and four touchdowns and added a rushing touchdown. On the other side, Tulsa quarterback Dane Evans almost matched with 421 passing yards and four touchdowns. 465 Dak Prescott put up some of his career's best numbers in Mississippi State's win over Kentucky. The Bulldogs quarterback accounted for 465 total yards and six touchdowns. 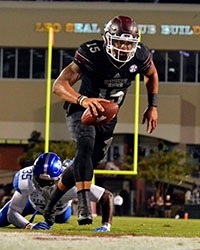 Prescott is only the third FBS quarterback in the last 15 years with 348-plus passing yards and three touchdowns along with 100-plus yards rushing and three rushing touchdowns in a single game. The only blemish in Prescott's game against Kentucky was his first interception in 288 passes, which was a school-record and the longest active streak in FBS.